Summer has long been a time for vacations, cookouts and pool parties. When the temperature heats up, the dangers to pets increase, too. To keep your dog, cat and other furry friends safe, make sure you are prepared. 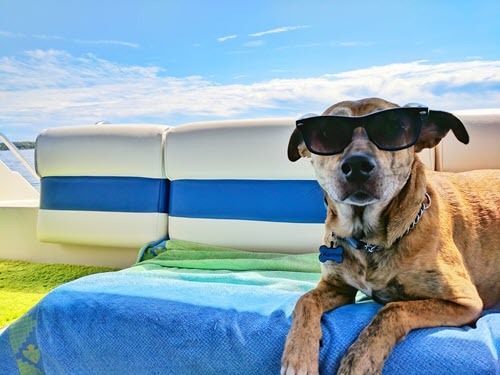 Dr. Elizabeth Rozanski, associate professor of clinical sciences at the Cummings School of Veterinary Medicine and section head for emergency medicine at the Foster Hospital for Small Animals, offers tips on preventing accidents and safeguarding your pet during the summer months. With all the time your pet will be spending outdoors, one of the biggest dangers is ticks. During the summer, Rozanski recommends that you or your dog walker check your pet for ticks at least once a day and look thoroughly after walks or trips through wooded areas. Ticks carry a number of diseases, including Lyme disease, but symptoms are often hard to spot. Dogs may be tired or feverish or become lame. So, also talk to your vet ahead of time about effective tick medication, and only use products that are made for your type of pet. Don’t worry if your dog pants. That’s how they cool themselves off. The hotter they are, the more they’ll pant, Rozanski says. Other ways to cool your pup include fans, ice packs, frozen treats, ice cubes, kiddie pools and sprinklers. Your kids and dog will have a blast. “If they seem weak or off-balance, cool them with a hose or wet towels and get them to a veterinarian as quickly as possible,” Rozanski says. Despite what YouTube may tell us, cats and rabbits don’t like to swim. “I believe most of the animals [in the videos] are not enjoying it,” Rozanski says. And not all dogs have mastered the doggie paddle. Some may not like water, and certain breeds like pugs and terriers, may have trouble swimming. So before you bring Fido to the beach or pool, buy a flotation device (yes, dogs can wear floaties too!) to keep your pup safe. If you are planning a boating adventure with your dog this summer, make sure he doesn’t jump overboard, which can be dangerous for animals. And never try to force your pet into the water. If you luck out and your pet enjoys splashing around, always rinse off after a swim. The chlorine, salt and bacteria in pools and lakes can be harmful. Animals should also have a shady area nearby where they can cool off and access to fresh water, as drinking salt water and pool water can cause health problems. We have all been guilty of it. You leave the dog or cat in the car to run a quick errand inside a store. But in the summer months or if the temperature is above 65 degrees, stop this bad habit. “It’s too great a risk to your dog’s health and should not be done,” Rozanski says. So keep your pet safe and bring them with you. More time spent outdoors means more potential encounters with slithering serpents. Many are harmless, but sometimes a snake’s bite is worse than your dog’s bark. Protect your pet (and the rest of your family) by keeping your yard tidy. Snakes love to hide, and tall grass and piles of junk are perfect spots. Remind kids that if they see a snake — no matter if it’s venomous or not — they should back away and leave it alone. “If your dog is inclined to chase wild animals, get him or her into the house until the animal goes away,” Rozanski says. If your cat is allowed to go outside, do a quick surveillance of your yard beforehand to make sure the coast is clear. Unfortunately, a cat or a small dog can be a perfect-sized meal for some snakes. If a pet is bitten by a snake, its face and head will become swollen and you should call your vet right away. Miami-Dade Fire Rescue’s Venom One team specializes in dealing with snakes and snake bites. They previously starred on Animal Planet’s Swamp Wars and have additional safety information available on their website. The ASPCA also has a guide on snake bite and safety prevention. Buzz. Buzz. It may not be a pleasant sound to us, but it can cause your pet to investigate. And while curiosity may not kill the cat (or dog), it can get them stung. So what should you do? If there is a lot of swelling, call your vet, who can suggest an office visit or prescribe an over-the-counter medicine. Some OTCs are harmful to pets, though, so never dispense them on your own. And watch how your pet responds to any swelling. If they are very irritated, they may scratch the stung area, pulling out the fur. These “hot spots” make your pet look bald. Bring your pet to the vet right away if you notice this behavior or these spots. Ever heard the expression, “It’s so hot, you can fry an egg on the sidewalk”? Things like black pavement (or asphalt) can get very hot and can harm your pets’ paws. Talk to your dog walker about what routes to avoid in the summer. Stay away from asphalt or rough pavement, pick softer routes and schedule walks for cooler times of the day. And what about booties? “If you think your dog will tolerate them, give them a try — but many really don’t like them,” Rozanski says. Plus, common sense tricks, like walking in the shade, can replace the need for booties. So try that before paying for something your pup may not like. Grooming is especially important in warmer weather. Brush your pet more often during the summer to get rid of excess or matted fur, which can weigh a pet down and contribute to overheating. “If they seem uncomfortable because of their thick coat, for example, dogs may pant endlessly, consider taking them to a groomer,” Rozanski says. Never cut too closely though, as a coat protects your pet from the harsh summer sun. Everyone loves a cookout, especially your pet, who gets to feast on table scraps. But a little of this and a taste of that can be bad for pets — and not just for their waistlines. Some surprising foods, such as grapes, onions, garlic and raisins, can be toxic to dogs if consumed in large quantities and should stay off their menu. Grapes and raisins are safe for cats, but keep onions and garlic away from them, Rozanski says. Watch out for these barbecue favorites that can pose a problem for your pet. “Table scraps and treats should be kept to less than 10 percent of a pet’s diet,” Rozanski says. Boneless chicken, hamburgers and hot dogs are OK, but limit them to small quantities. As you know, most pets eat anything and everything, so keep an eye on what they’re indulging in. And be sure meats are not seasoned with garlic or onions, because, as previously stated, these are toxic for many animals. Meat with barbecue sauce: This slow-cooked delight can cause non-delightful diarrhea in dogs. Corn on the cob: Dogs often have difficulty digesting corn cobs, and this grilling staple can be a choking hazard. Fruits with pits: Peaches, avocados and other pitted fruit can be choking hazards. Food with bones: Squeaky bone that’s a toy: great. Real bones in food: not so much. Even things like bone-in wings can be very dangerous for your pet, as they may splinter and hurt their GI system, sometimes even piercing their bowels. Avoid the emergency room by not feeding your pet anything with bones. Foods with toothpicks or skewers: An overlooked toothpick or skewer can pierce or make a hole in the intestines. Ice cream: A little of any flavor is fine for some dogs, but it may not agree with all dogs, especially if they have sensitive stomachs. Just like people, some dogs can be lactose intolerant. These dangers may sound scary, but a little preparation and a watchful eye is all you need to take the heat off your summer. You can also get more hot weather tips from our previous article When Its Too Hot For Your Pet. If you have any questions about how the heat is affecting your cat or dog, please do not hesitate to ask us at FCVC. We love helping our pet friends!